Driving at Blyton without door mirrors was definitely a challenge and is something that I really don't want to experience again but time didn't allow me to fit them in advance. I must admit I was more than a little concerned about this aspect of the build given that any error could result in the screen, or at the very least the screen struts, being damaged or written off. As I have noted elsewhere in this blog, my build CD has been corrupt from day one so I had to get a copy of the installation diagram from GD. First off, I put masking tape on the screen strut and marked a centre line. I removed the screws holding the strut in place and transferred the measurements from the drawing before drilling a pilot hole. I then opened the hole up to 3.2mm ready to tap at 4mm. Once the hole was tapped, I fixed the bracket in place to double check the position of the other mounting hole and repeated the process. 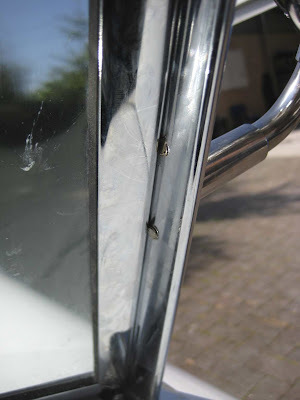 The fixing bolts need to be cut down so that they don't protrude through the strut and foul on the screen itself and the screw that goes through the strut under the mirror fixing bracket also needs its head flattening so the bracket fits flush to the strut.